April 10, 2018 – CITY OF INDUSTRY, CA –Acorn Safety has released a redesigned product line brochure. 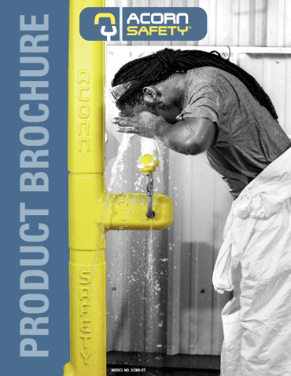 The products brochure features an all new look and includes many examples of the available eye/face washes, drench showers, and combination units that Acorn Safety offers. Additionally, the brochure offers information on products that may complement an Acorn Safety product, such as Chronomite® Instantaneous Electric Water Heaters, Acorn Controls® Thermostatic Mixing Valves, and Indoor Tempering Systems. To see the new brochure and learn more about the newest additions to the Acorn Safety product line, click here.